a few days behind here. apologies for the delay, but better late than never, amirite? ah, the "quick, but healthy bite to eat." sometimes hard to find for vegans ... that is, if you aren't in the mood for a salad. this ideal meal was just what my friends (hi, blair & lauren!) & i were looking for one weekday night. after much debate, blair suggested standard market grill, located at clark & fullerton in lincoln park. since it wasn't far from our final destination, off we went. according to their website, "standard market grill is a celebration of food, featuring an eclectic variety of chef-inspired cuisine in our sophisticated yet casual environment. each dish is made to order with fresh, seasonal ingredients." i can attest to this statement : it's true! standard market grill does have a pretty sizable menu with a lot of options. and you order at a counter, which makes it quite speedy. 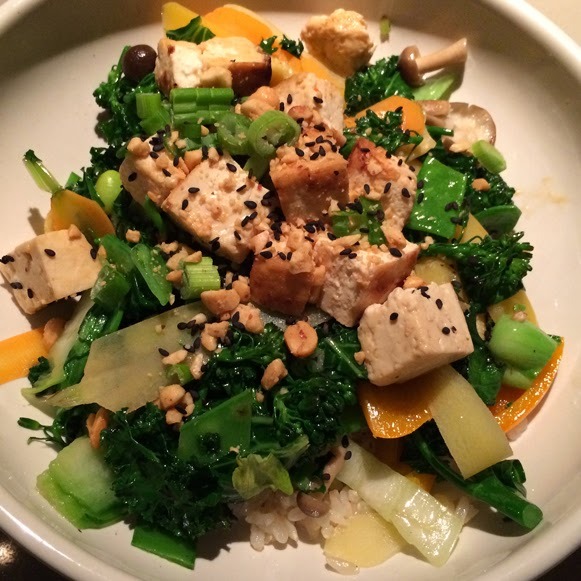 brown rice, seasonal market vegetables, peanuts & tofu. i could have gone for a salad instead, but meh. this sounded more exciting. the peanut vinaigrette it comes with had egg in it, so we subbed out for a balsamic, which worked surprisingly well with this asian inspired bowl. overall, something i'd definitely order again. plus, it had kale in it. so i was automatically pumped. i'll go far as to say that standard market grill is the perfect place for the often unattainable "quick, but healthy bite to eat." if you're looking & happen to be in the hood, definitely stop in.